Indus Valley Bio Organic Soft Black hair colour which is a completely hair treatment. It gives you color, prevent hair loss, dandruff, suitable for hypo- allergenic people. It does not contain harmful effects . 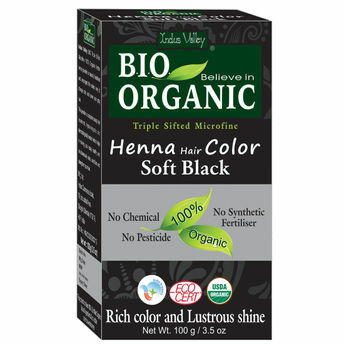 Indus valley Bio organic soft black hair color is USDA, Ecocert & 100% organic certified hair color. As it contains Henna (Laws onia Inermiids), Indigo (Indigo era Tinctorial), Colourless Henna (Cassia Auriculate).